When I posted about Newfs, Diane asked about Pappillons. From what I can tell, there were certainly tiny toy spaniels around the courts of Europe that could have been the ancestors of today’s Pappillons. You see plenty of them in art dating back to at least Titian in the 15th century (detail of his Venus of Urbino to the right). The upstanding “butterfly” ears of the modern dog however are Victorian, and I don’t see the name used until the early 20th century (OED: 1907 R. LEIGHTON New Bk. Dog XVII. lxi. 536/1 A very engaging little dog is the Papillon, or Squirrel Spaniel). Before the late 1800s, all the spaniels have floppy ears (what are now called Phalene [moth]). Both Phalene and Pappillons are still born in the same litters, so it would seem the Paps area are a Victorian sport that caught on. From Wikipedia: "The history of the papillon is traced through works of art. The earliest toy spaniels resembling the papillon are found in Italy. 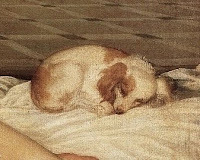 Tiziano Vicelli painted these small dogs in many famous paintings beginning around 1500 including the Venus of Urbino (1542). Other well known artists who included them in paintings are Watteau, Gonzalez Coques, Fragonard, Paolo Veronese, and Mignard. In a painting after Largillierre in the Wallace Collection in London, a papillon is clearly shown in a family portrait of Louis XIV. " 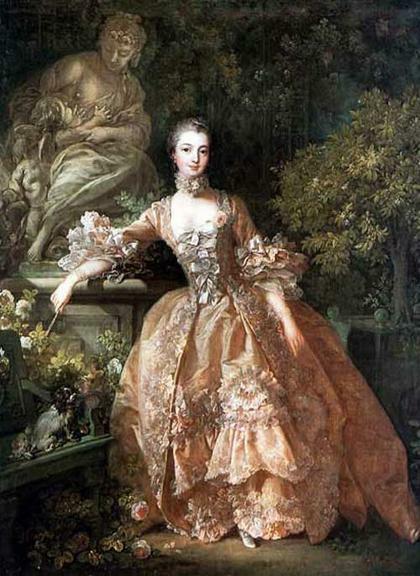 We know that Madame de Pompadour had small spaniels (there's one on the bench below her right hand in the painting on the left), as did Marie Antoinette. 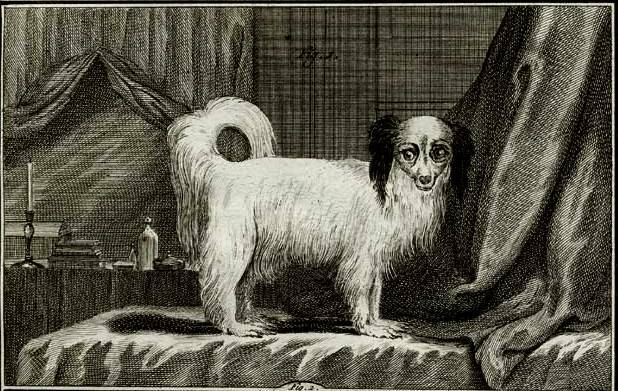 Buffon, in his 1766 series of engravings, shows a toy spaniel of the type we're talking about (bottom right image, L'Epagneul). Dr. Caius’s Synopsis of British Dogs (1816) has a “type” that would contain these toy spaniels: “The spaniel gentle or comforter . . . the modern lap-dog.” Lap-dog is also a good catchall, dating to the 1640s. I think this is going to be one of those areas where you’re either going to have to fudge the history and use the modern name (though that could be misleading, as the modern version of the dog didn’t exist), or you’re going to have to settle for a more period, and more general, description, such as lap spaniel (which I do find in use by the 18th century per Goggle Books). And then of course there were Charles I and II and their spaniels, which were used as companions and lap dogs. Our present day Cavalier King Charles breed, which dates only from 1929 is the result of a contest to recreate the breed known to the English kings. I didn't know that the Papillon was also called the Squirrel Spaniel. Is that because they chase them? As far as I know the name Papillon derived because the shape of the head with the feathered ears resembles a butterfly (Papillon being the French word for butterfly). Dr. Caius’s Synopsis of British Dogs (1816) lists the King Charles by name and as it's own type of spaniel. But I always wonder about their temperament. So many small dogs have outsize personalities for their petite bodies. Did these squirrel spaniels retain the hunting instincts and noses of their larger counterparts - or did their nickname come from their size? Okay, I admit it: I probably need to write at least one of these dogs into a manuscript. Nickname came from their size and their tail, not because they hunted squirrels.